Tens of thousands of people will head to Omaha, Nebraska, this weekend to watch Warren Buffett sit on a stage and talk about stocks, the economy and whatever else strikes his fancy. Berkshire Hathaway's annual meeting — the so-called Woodstock of Capitalism — is always fun for loyal shareholders to attend. In addition to the folksy wisdom dispensed by Buffett and Berkshire vice chairman Charlie Munger, Berkshire fans are treated to a movie, often featuring celebrity cameos. There's more: A shopping pavilion features products from Oriental Trading and other Berkshire subsidiaries. A booth offers insurance quotes from Berkshire's Geico. A 5K race is sponsored by Brooks, the Berkshire-owned running shoe company. And there are plenty of Dilly bars from Dairy Queen. That, too, is part of the Oracle of Omaha's orbit. If you aren't going to Nebraska, fear not. Yahoo Finance will once again stream the festivities from the CenturyLink Center on Saturday — and CNNMoney will cover the news as it happens. Here are six things to watch when Buffett and Munger hit the stage. Buffett will turn 88 in August, and Munger celebrated his 94th birthday on New Year's Day. That raises the question of who will one day follow the country's most celebrated investor. Buffett wrote in Berkshire Hathaway's 2015 annual shareholder letter that "we now have the right person to succeed me as CEO — a successor ready to assume the job the day after I die or step down." But Buffett has not named that person. In January, Berkshire (BRKB) named two top Buffett lieutenants to the company's board: Greg Abel, CEO of Berkshire Hathaway Energy Company, and Ajit Jain, executive vice president of Berkshire Hathaway's National Indemnity Company insurance subsidiary. Presumably, that means that the person Buffett was referring to three years ago is either Abel or Jain. Buffett or Munger could give more hints on Saturday. But Berkshire markets gurus Ted Weschler and Todd Combs will probably keep managing Berkshire's investments. In other words, it may take more than one person to replace Buffett — even though most would argue that he's irreplaceable. 2. Will Buffett defend Wells Fargo? Last year, Buffett called Wells Fargo's handling of the fake-accounts scandal a "huge, huge, huge error." The bank's problems have only gotten worse since then. Some investors have argued that newish CEO Tim Sloan needs to step down. Buffett has stopped short of calling for major management changes. But shares of Wells Fargo are down 6% in the past year, and rivals JPMorgan Chase (JPM), Citi (C) and Morgan Stanley (MS) are all sporting double-digit percentage gains. Buffett can't be too pleased about that. Berkshire still owns more than 458 million shares of the bank, a 9% stake. Buffett was a vocal supporter of Hillary Clinton for president. But Buffett acknowledged in this year's shareholder letter that $29 billion of the $65 billion gain in Berkshire's net worth in 2017 was because of the Republican-backed corporate tax cut that President Trump signed into law late last year. But any lift that Berkshire could get from lower corporate tax rates may be mitigated by trade scuffles with China. The US-China concerns are one reason the market has taken a hit lately. Berkshire's stock is down about 3.3% this year, a little more than the S&P 500. That makes sense. Berkshire has a big investment in the Chinese car company BYD. And many Berkshire investments, such as Apple (AAPL), GM (GM) and Coca-Cola (KO), have a major presence there, too. A cartoon face of Buffett was even featured on Cherry Coke cans in China last year. So will Buffett blast Trump (or China) for the recent tariffs? 4. How about them Apples? Speaking of Apple, the iPhone maker is now the biggest investment in the Berkshire portfolio. Berkshire's stake in Apple is worth more than its positions in Wells Fargo, Bank of America (BAC), Kraft Heinz (KHC) and Coke. And Buffett just bought more: He told CNBC that Berkshire has added 75 million shares, on top of 165 million at the end of last year. "It's an unbelievable company," Buffett said. Apple impressed investors this week with earnings that topped forecasts, helping to allay fears about sluggish iPhone sales. But it's worth wondering whether Buffett is too late to be backing Apple. After all, Berkshire had been a big investor in IBM (IBM) for years. It has finally started to trim that stake as Big Blue's profit and sales growth has slowed. Buffett is famous for shunning a lot of tech because he likes to buy what he knows and is wary of paying too high a price for the stock. Still, some would argue that Berkshire would be better off owning Google (GOOGL) owner Alphabet, Amazon (AMZN) or Facebook (FB) in addition to — or maybe even instead of — Apple. 5. Let's make a deal! Buffett noted in this year's shareholder letter that Berkshire Hathaway has $116 billion in cash, up from $86.4 billion at the end of 2016. Buffett has made it no secret that he wants to use some of that money to buy more companies. "This extraordinary liquidity earns only a pittance and is far beyond the level Charlie and I wish Berkshire to have," Buffett wrote. "Our smiles will broaden when we have redeployed Berkshire's excess funds into more productive assets." Related: Buffett loves Coke. But would he back a Pepsi buyout? So what could Buffett buy? He said in an interview with CNBC in February that he "wouldn't rule out owning an entire airline." Berkshire Hathaway already owns stakes in American (AAL), Delta (DAL), Southwest (LUV) and United (UAL). Buffett is clearly itching to do something. The last big deal Berkshire made was the $37 billion purchase of aircraft components manufacturer Precision Castparts in 2015. Kraft Heinz offered more than $140 billion for consumer products giant Unilever (UL) last year, but Unilever turned the bid down. Berkshire is often rumored to be considering other large food and consumer products giants, such as General Mills (GIS) or Kellogg (K), or Oreo owner Mondelez (MDLZ). The possibility of Buffett taking Coke private even pops up from time to time too. 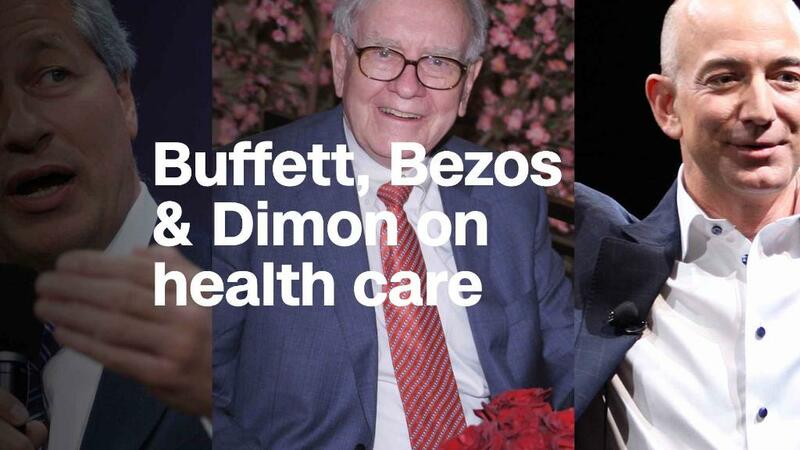 Berkshire Hathaway, along with JPMorgan Chase and Amazon, shocked the business world in January when the three giants announced plans to form a company that would help manage rising health care costs for their workers. Shares of the big health insurers, drug store chains and pharmacy benefits management companies all plunged on the news. That's because even though details are still scarce, Berkshire, JPMorgan Chase and Amazon promised that the new company would be free of "profitmaking incentives and constraints." Buffett said on CNBC in February that other companies have inundated him, JPMorgan and Amazon for details about how they could sign up for the yet-to-be-named insurer. But Buffett isn't promising miracles. He noted in the CNBC interview that health care is "enormously complicated." But he added that "we're determined. We've got the money. We're going to stick with it." So don't be surprised if Berkshire shareholders — and perhaps an employee or two — asks Buffett for more details about how he hopes to improve the US health care system.